There was once a jolly little steam engine. He worked very hard and was always eager to please, but he just wasn't strong enough to haul loads of zinc pellets or rubber gaskets or the other things that the bigger locomotives could haul. Every morning, the little engine stood in the rail yard and watched his friends leave for the day with long lines of railroad cars rumbling behind them. And then the little fellow would fill his tiny boiler with coal and head into town, where he spent his days pulling a trolley full of screaming children around the petting zoo. But all that changed one fateful winter day. The locomotives had been enjoying a leisurely breakfast when all of a sudden, the door to the yardmaster's office flew open. "Listen up," the yardmaster barked, sweat dripping off his panic-stricken brow. "There's a terrible epidemic of hemorrhoids in Saskatchewan. I need one of you to haul an emergency shipment of ointment over the mountain, right now!" The big locomotives looked at one another and shrugged their shoulders. "I can't," said one of them, "because my wheels are being polished this afternoon." "And I ran over a hobo yesterday," another grumbled, "so there's a lot of paperwork to fill out." "We're all so very tired, and that mountain is so very tall," said a third locomotive, letting out a great yawn. "Don't they have ointment in Canada?" Well, the yardmaster pounded his fist against the door and called the locomotives all sorts of names that made the little engine's ears turn bright red! Soon, the little fellow decided there was only one thing to do. The big locomotives began to laugh and laugh. Why, the little engine had hitched himself to the tanker car full of hemorrhoid ointment, and he was trying to pull it all by himself! Even the yardmaster had to chuckle. But that didn't stop the little engine. "I-think-I-can! I-think-I-can! I-think-I-can!" he said, his smokestack puffing furiously. And to everyone's surprise, he began to inch forward. "I-think-I-can! I-think-I-can! I-think-I-can!" the little engine exclaimed as he rolled faster and faster down the tracks. "I-think-I-can! I-think-I-can! I-think-I-can!" he gasped as he began to climb the mountain. Hooray! 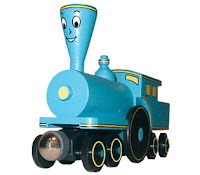 cried all the other locomotives, realizing they had greatly underestimated the little engine. Hooray for our friend! Soon the little engine reached the mountaintop! And then there was a terrific boom as his boiler exploded, and a great plume of wretched black smoke erupted into the sky. The other locomotives stopped cheering. The yardmaster shook his head sadly and walked back into his office. After gulping down a great big glass of whiskey, he called the Premier of Saskatchewan to deliver the bad news. Up on the mountain, the little engine felt like he had the worst tummy ache in the world. And if that wasn't bad enough, it began to snow. "Oh dear, oh dear," said the shivering little engine. "I'll never try to exceed my personal limitations again!" Was that Canadian hemorrhoid ointment, PREPARATION EH?? In addtion, in Saskatchewan, can that be used on a sore Regina as well? How twisted, but entertaining. Loved it! HA! I love it, and it's so inspirational!